This visit to Kabul has been short and sweet, if not full of its usual challenges. Following the spate of recent attacks that have marked an significant increase in violence over the past months since I was last here (Intercontinental Hotel, US Embassy, Rabbani’s assassination) I arrived on the 2nd day of national mourning to quiet and often barricaded streets. Add in some cross border rocket attacks by Pakistan into Afghanistan and the shift in talk to ISI and Haqqani’s as the real threat behind terrorism, and you can say tensions are more than a little stretch. Consequently, two public street marches within a few days in the central Shar e nau district, with chants of “death to Pakistan” “death to the Taliban” show that the Afghans are not going to continue to take attacks quietly. Sadaf has a bit of a swagger as she moves. Her dark hair is pulled off her face and her pale pink headscarf is tied tightly in a way that reminds me of my sister’s soccer team in Colorado rather than a typical Afghan girl in Kabul. But Sadaf is not a typical Afghan girl. And neither are the other twenty or so girls gathered in the dark, leaky basement of Kabul Stadium with their trainer, former Afghan boxing champion Saber Sharifi. I’ve come to Kabul Stadium, most famous for its use as the site for public executions under the Taliban, to see the strength of Afghan girls personified in sport. Boxing. Sadaf is 17 years old and has been boxing here for four years. She and the other girls go through a half hearted warm up but come alive when its time to don red boxing gloves and their swagger emerges. 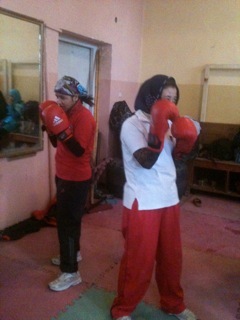 Shoulders loose, punches strong, and feet quick – their body’s exude confidence not seen elsewhere in Afghanistan. They are all dressed conservatively, with long pants and long sleeves accompanying sheer headscarves which during bouts they trade for traditional boxing headgear. September 27, 1996, the Taliban took Kabul. The first thing they did was brutally execute President Najibullah and leave him hanging from a lamppost for all to see. Exactly 14 years later, today, hundreds of Afghans marched in Kabul to protest the recent assassination of former President, Burhanuddin Rabbani, the leader of the High Peace Council, assassinated by the Taliban two weeks ago. Chanting, “death to the Taliban” “Death to Pakistan”, the protest remained peaceful. Organized by Amerullah Saleh, the former spy chief, demonstrators carried pictures of other key Northern Alliance figures slain by the Taliban in recent months, including General Mohammad Daud Daud, the police commander of northern Afghanistan who was killed in June. A written statement on the Voice of Jihad stated that revolutions are no substitute for jihad. Guess the Taliban aren’t fans of social uprisings like those seen in the Arab Spring? Can’t say I’m surprised, Afghans marching in the streets, standing up for their rights, using their voices to protest does not bode well for the Taliban. Rather than scaring the populace with their country-wide attacks, roadside bombs, suicide bombs, and assassinations, they are emboldening it to stand up. Speak with the majority of Afghan citizens about life under the Taliban and their willingness to return to that era and you are typically met with a resounding, “no thank you please”. It was a time of darkness for men and women alike, where fear controlled the country. Fear breeds in silence, the only way to combat this elusive foe is standing up publicly against it. Voicing your opposition. The very freedoms we too often in the West take for granted, the freedom of assembly and the freedom of speech, are those that can inspire change. Nearly three dozen young women marched in the streets last July to <a href=”http://http://www.afghanistan-today.org/article/?id=138&#8243; target=”_hplink”>protest public harassment</a>. 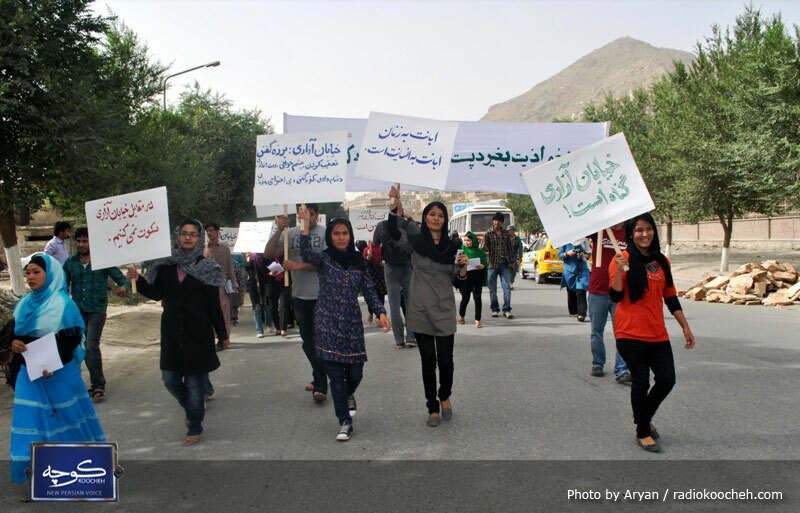 Organized by <a href=”http://http://www.youngwomenforchange.org/&#8221; target=”_hplink”>Young Women for Change</a>, an emerging feminist group in Kabul, the women carried signs that stated, “Its my street, too”. Becoming the second such time in recent years that women have organized publicly to voice their rights. “By holding such marches and campaigns we want to draw the attention of the public, the government and the international community to this problem,” said Noor Jahan Akbar, the 19-year-old founder. It is still unknown if protests like the one today may become more commonplace in Afghanistan, lesser known still, if they will remain peaceful or be railroaded by those wishing to create more chaos. Could it signal an Arab Spring like movement, seen throughout the Middle East this year, or the start of another civil war? Only time will tell. But the right to assemble publicly, to demand equality, peace, and justice are rights worth taking to the street.